Porcelanosa Group celebrated the refurbishment of their impressive showroom last Wednesday 19th July. Celebrities, including well-known model, Nieves Álvarez, who maintains a close relationship with the brand, added wow-factor to the event. Guests were treated to a surprisingly original tasting menu created by Ariadna Salvador and Pau Navarro of Clandestí Taller Gastronòmic – no wonder their trendy restaurant in Palma is such a success! The 2,500 square metre showroom is dedicated to the latest cutting-edge designs from the eight firms that make up the group. Architects and interior designers came together to share their appreciation for high quality wall tiles, floor tiles, kitchens, bathroom equipment and avant-garde building systems. 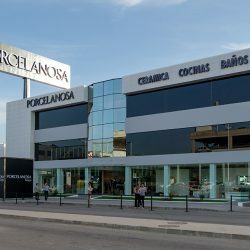 Located in Son Castelló, this space is just one of 400 showrooms belonging to the industry leaders. If you love luxury design, it’s well-worth a visit.